What could possibly be better than prosciutto and eggs? A Prosciutto di Parma and Egg Breakfast Sandwich. This savory delight is sure to get you up in the morning, and keep you going throughout the day. The runny egg, crusty bread and buttery Prosciutto di Parma are a combination that may even make you an early riser; especially if served with a strong cup of coffee (or two). 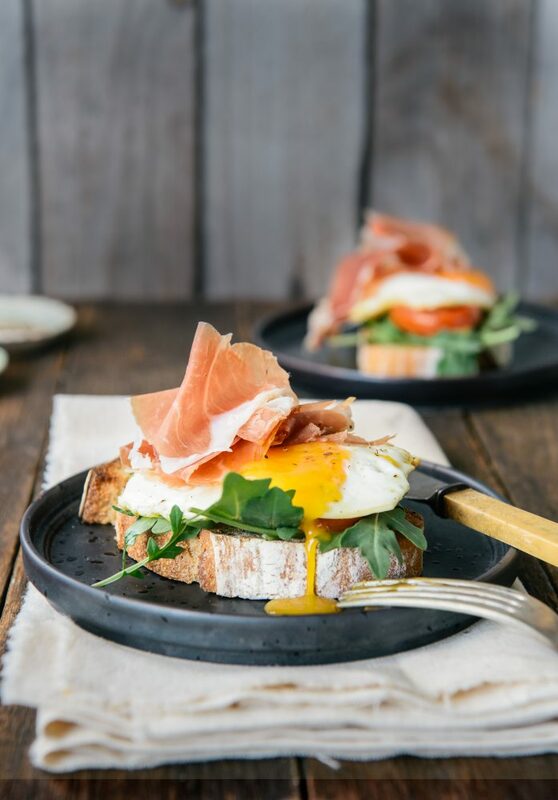 If you’re looking for a simple, yet sophisticated breakfast to impress visitors, roommates or significant other, these prosciutto and eggs sandwiches are the only way to go and are great to serve no matter the season. Place tomatoes on small baking sheet and roast until just tender, 10 minutes. Reduce oven temperature to 350°F. Arrange bread on another baking sheet; brush with 1 tablespoon oil and sprinkle with salt and pepper to taste. Place in oven and toast just until golden, about 5 minutes. Meanwhile, heat 2 tablespoons oil in a large skillet and fry eggs sunny side up, or as desired. To assemble the sandwich, place a slice of toast on each of 4 plates. Top each with 1/4 of the arugula, 2 tomato slices, a fried egg and one slice of prosciutto. Finish with cracked pepper and sea salt to taste.